encrypted_number is the base64-encoded encrypted credit card number. The party responsible for passing the Encrypted card numbers to Acctivate via the API will enter the CC encryption key once into the webstore template options. Acctivate will then encrypt that key using a proprietary encryption in the company database. 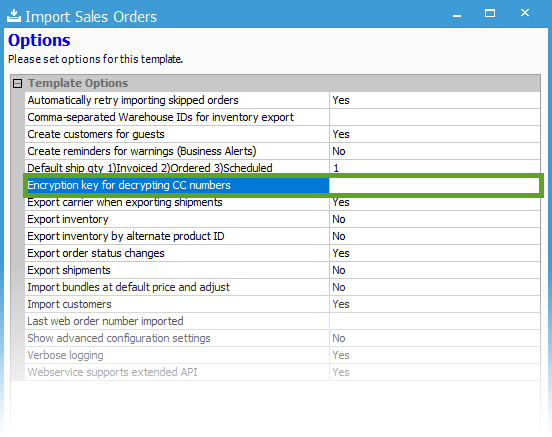 To enter the key into the webstore template options, go to File > Import Sales Orders. Then find the corresponding template id and select Edit. You’ll select Next twice and then the template options page will show. You will enter the CC encryption key you have generated into the ‘Encryption key for decrypting CC numbers‘ field. Close the window and select to Save changes. The key will then be encrypted in the database and users will not be able to view it on the template options either. Note that since the IV should be randomly-generated, encrypting the same CC number with the same key should generate a different encrypted result each time. However, decrypting the encrypted number should result in the correct CC number.
''' Encrypt CC Number using strong encryption that is PCI compliant.
' Zero pad ClearText byte array on the right to multiples of the Block Size.
' Check to make sure ClearText byte array is now a multiple of the Block Size.
''' Converts hexadecimal number to a byte.
''' Convert a string of an even number of hex digits into an array of bytes.
''' Convert byte to two hexadecimal digits.
''' Convert byte array to an even number of hexadecimal digits.
''' Decrypt CC Number using strong encryption that is PCI compliant. * Encrypt CC Number using strong encryption that is PCI compliant. * Decrypt CC Number using strong encryption that is PCI compliant. """Encrypt CC Number using strong encryption that is PCI compliant. """Decrypt CC Number using strong encryption that is PCI compliant.